Today we’d like to introduce you to Shannon Bayless. Working with dogs and their people is my lifelong dream and challenge. From a childhood focused on animals, my early and only goal for my adult life was to facilitate their thriving. 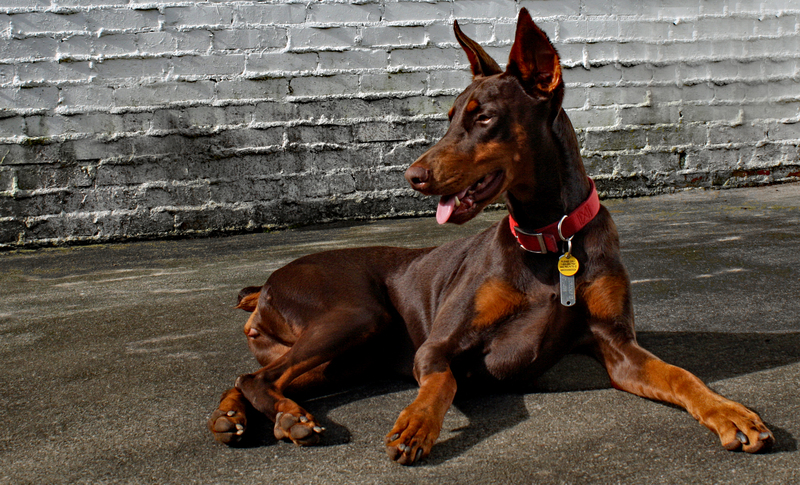 I began training my own dog when I was 11 and went on from there to other dogs and pet birds. Fortunately, the science of learning and behavior has changed animal training methods for the better since my youth. While I regret the years of following standard methods that involved force and fear, it allows me to speak from experience when offering more efficient, less coercive methods. In Tune Dogs got started near the end of my career in accounting so I could bring to others what I learned and continue to learn from behavioral science and a life dedicated to dogs. 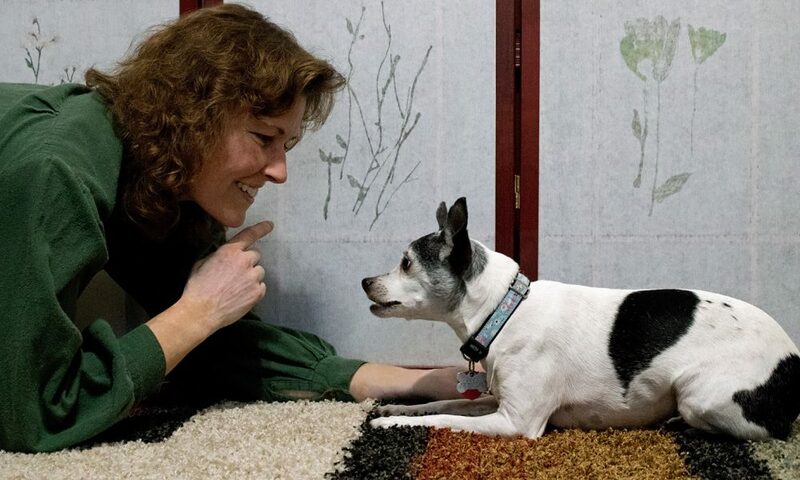 Because of working in dog “rescue and rehab” for many years, I initially began In Tune: Dogs and Humans, LLC to help humans learn to communicate with their dogs and make it possible for more dogs to stay with their families. As I worked with more and more families, I discovered that I like the humans as much as the dogs. All beings need kindness and patience. Actually, some things have been smooth. Overall, it’s been a series of challenges, with a new one to meet almost every day. But I’m like the terriers I adore in that I get restless without a challenge or a new trail of curiosity to follow. Aside from the usual financial hurdles of being self-employed, the most difficult thing for me has been the painful emotional impact when dogs or their people are mistreated, grieve family loss, suffer medical emergencies, or die. The easy part is the pure joy of a formerly fearful dog happily experiencing more of the world, that moment when a person or dog suddenly has a revelatory understanding, the calm empowerment of a formerly overreactive dog, every time a brain is more effective than brawn, and witnessing the love people have for their dogs. The easy part is appreciating who a dog truly is and being blown away by the unique talents, philosophies, and life experiences of the people I come to know. The difficult part is the heartbreak that can accompany caring. In Tune Dogs – what should we know? What do you guys do best? What sets you apart from the competition? In Tune Dogs specializes in intervention for challenging dog behavior in all breeds, from timidity to unruliness to aggression. 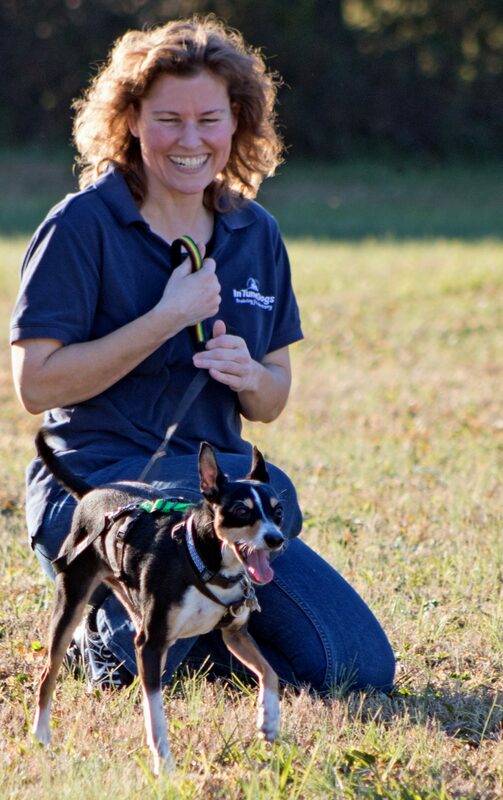 I am certified by the Karen Pryor Academy for Animal Training & Behavior to use positive reinforcement to solve behavior issues and train manners and I have decades of experience training and handling dogs. My focus is on individualized training plans tailored to the specific needs, abilities, and environment of the people and the dog. I offer creative solutions for training blind dogs, deaf dogs, dogs with other physical challenges, and dogs with histories of neglect or other mistreatment. I help people help their dogs with a holistic approach to trauma recovery. I love collaborating with families who want expert guidance while they practice the training between regular sessions. 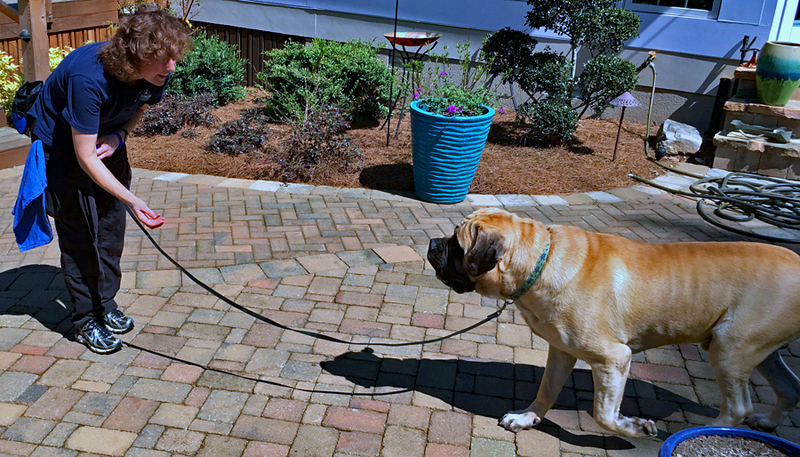 I’m also happy to do all the training myself for busy people who just want to ask for reliably trained behaviors from their dogs. Behavior assessments and training sessions are usually done in the dog’s home environment after a free phone consultation. In some cases, we can work remotely via video conference, which is helpful for those living over 50 miles from Athens, GA. Phone, text, and email support is always included and available from the beginning of a professional relationship to as long as the client needs it. 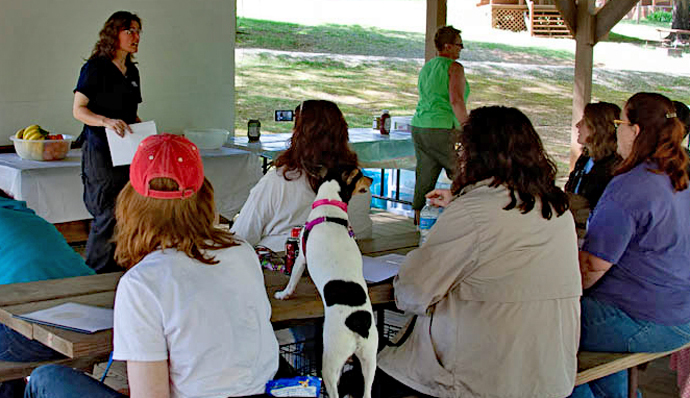 In Tune Dogs also offers canine behavior and related educational programs for classes of human students. 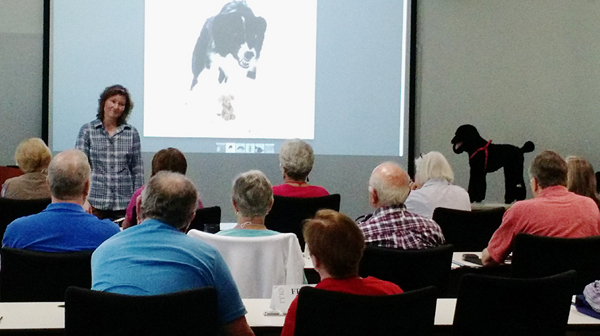 I teach volunteers for canine rescue organizations and members of the Osher Lifelong Learning Institute at the University of Georgia. Currently, I’m looking for a safe, clean location where I can once again teach puppy classes in a way that puppies and their people can learn best and have fun. It thrills me to help people give their puppies a solid foundation for living happily in our world at the same time offering tips to ease the puppy-raising workload. Puppies are a lot of work so it’s a good thing they’re cute! As a behavior consultant, I am proud of my ability to meet people where they are. I’ve been in the client role with behavior consultants and dog trainers and I learned firsthand how anything less than compassion and nonjudgmental education blocks learning. Success to me is having the resources to support my business while enjoying the intrinsic rewards of being of service to others, having time to care for myself and my family, and having the freedom to continue to evolve.